I am, and to quote Nigella as I have been watching old episodes of her Nigella Bites show, in Temple Food mode. I have been being particularly out of control with my biscuit habit recently and decided enough is enough. Woman can not live by chocolate coated Malted Milk biscuits alone. 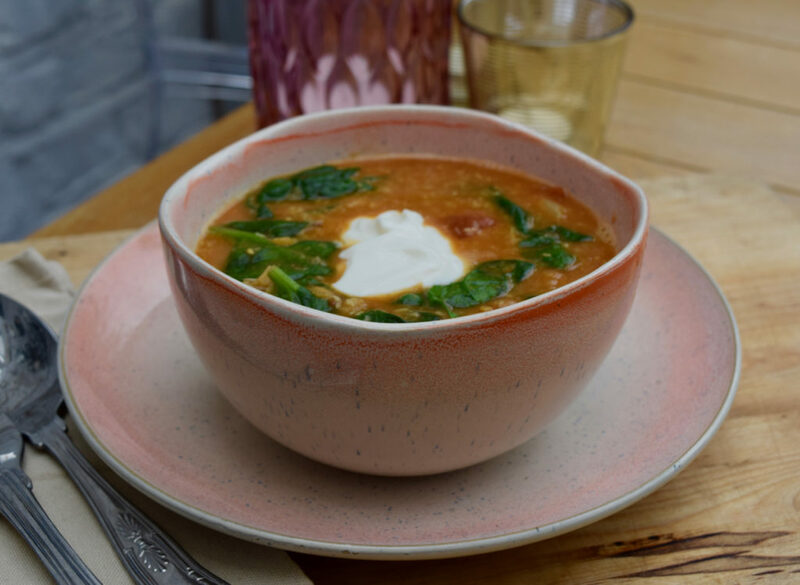 Also, my vegan selection on Lucy Loves is a little thin on the ground so this week I am sharing this Coconut Lentil Soup, which not only happens to be vegan, it’s totally lovely. Working for a catering company is amazing. Not only does our chef cook lunch for us everyday, but we have delicious client canapé and dinner tastings in the office, which I show little or no restraint when it comes to minesweeping the leftovers. All this leads to me being quite the porker at present. 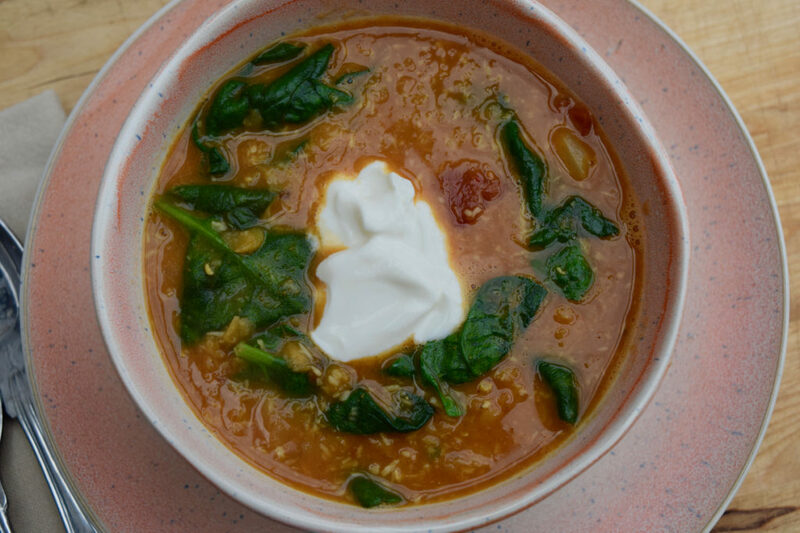 So in full Temple Food mode, I stumbled upon this Coconut Lentil Soup on the Bon Appetit website, which I love, and thank them for dearly. This is such a full flavoured, simple recipe, you can’t help but fall for it’s spicy, slightly sweet nature. It cooks in just under an hour and is a kind and low maintenance dish. 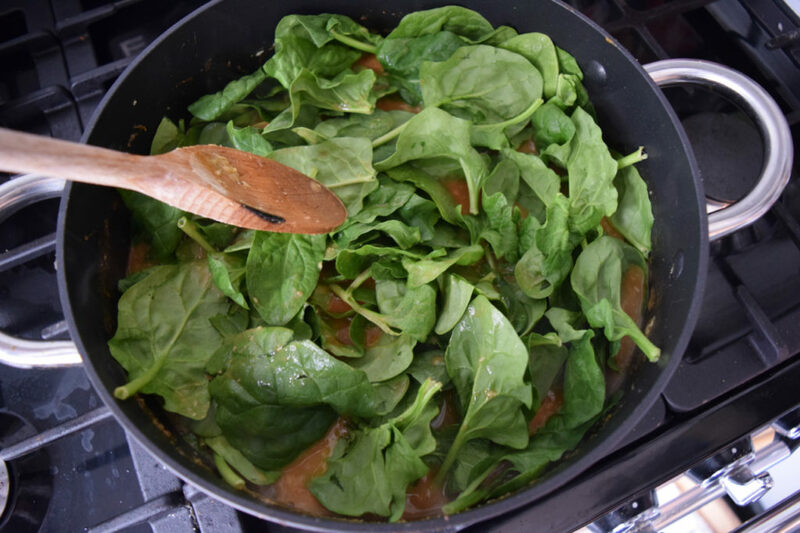 The original recipe called for frozen spinach, but as much as I love it’s handy nature, it can sometimes make a dish look sludgy, so I went for fresh. 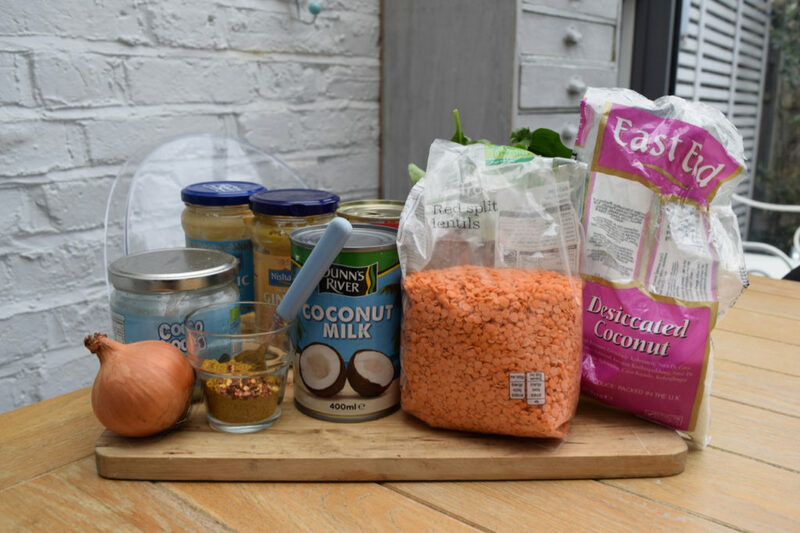 This recipe, to add to it’s long list of pro’s, is a frugal one too; the lentils used cost less than 50p. As well as being cheap, these add a good hit of protein, which is right up my street as I am trying to kerb unnecessary carbs with the excesses of Easter being on the horizon. Plant based eating is everywhere at the moment, but rarely on our table. Clyde is a committed meat eater who raises his eyebrows at a vegan meal; but he still wolfed down this rich, spicy soup and loved it. If that isn’t a glowing review, I don’t know what is. Take a large saucepan and add the 2 tablespoons of coconut oil. Heat over a medium flame until sizzling then add your large onion, chopped, and cook until just translucent and turning golden, around 5 minutes. Add the garlic and ginger, either from a jar or chopped and crushed, and cook for another couple of minutes, making sure this doesn’t burn. 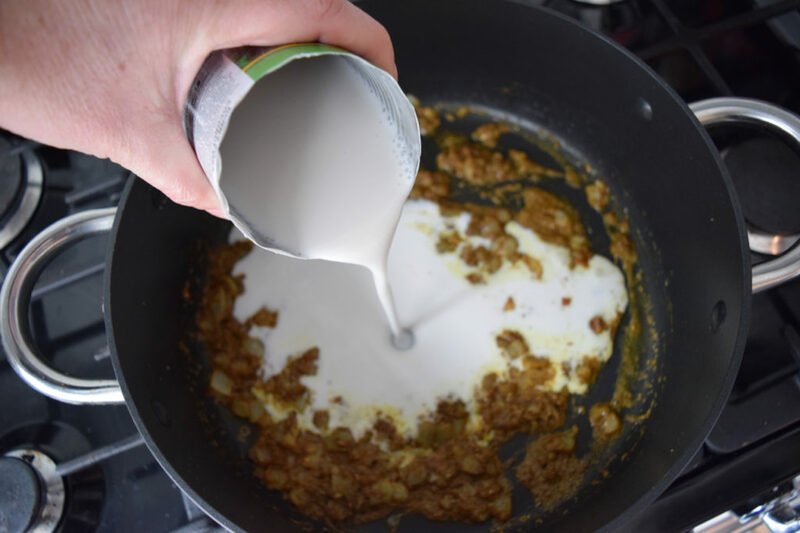 Add the curry powder and chilli flakes, cook for a minute, then pour in the coconut milk, water or stock, salt, lentils and desiccated coconut. Stir well then turn the heat down to low and simmer for around 25 minutes or until the lentils have softened and the soup’s thickened. 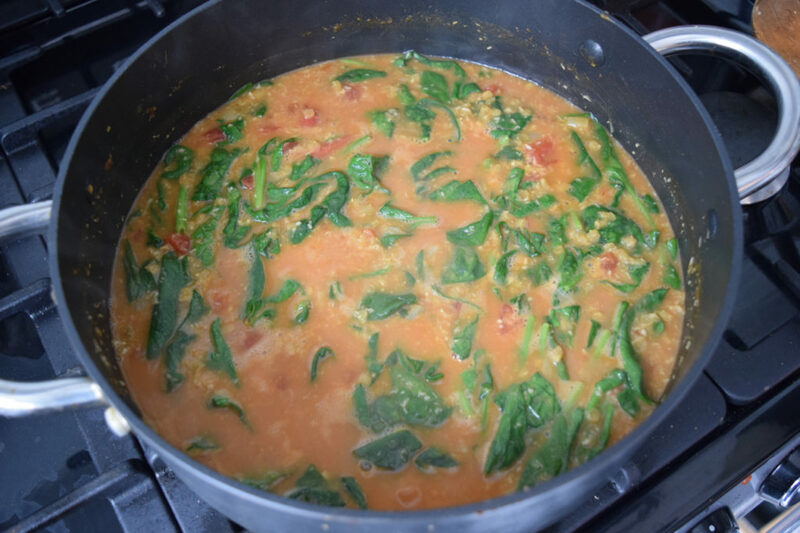 Stir in the tinned tomatoes, bring back up to the simmer then add the fresh spinach and cook until just wilted. 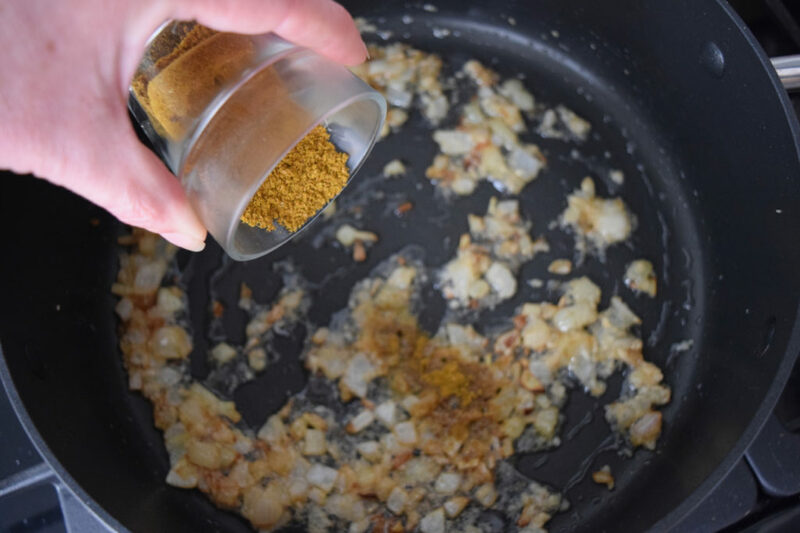 Check for any additional seasoning, then serve, piping hot, in large bowlfuls. 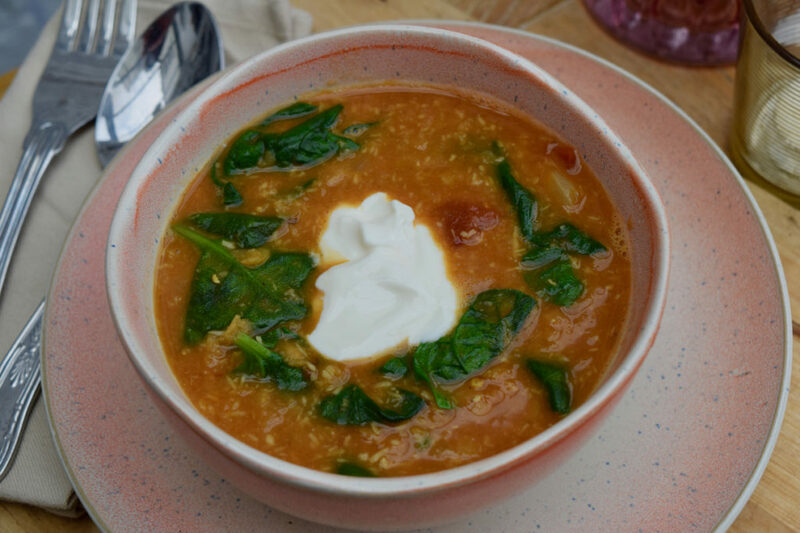 Garnish with a dollop of coconut cream, yoghurt or sour cream.